This is my first Michael Crichton read, and I loved it. Prey is told in first person by Jack Foreman, a stay-at-home dad, who suspects his wife, Julia, of having an affair. Julia, a vice president at Xymos, a molecular manufacturing company, works late night, and one night she doesn't even come home at all. Eventually, Julia shows Jack a video demonstration of what they’re working on - a cloud of nanoparticles, which works as one big camera. Then something goes wrong at the facility and Jack is invited by Ricky, his former employee to come and help fix the problem. A cloud of nanoparticles -- micro-robots -- has escaped from the laboratory, and he has to get it back. But this cloud is self-reproducing, intelligent; it evolves quickly, and is now a threat. There at the facility Jack learns the truth about his wife, the nanoparticles, and his former co-workers. The book has a slow start. Jacks suspects his wife of having an affair and he’s taking time on deciding what to do because he isn’t very sure yet. He doesn't want a divorce; he wants to keep his family together, and his kids, always biting each other, are not helping matters. He can’t get a job; he’s rejected wherever he applies because of a ‘got fired for doing the right thing’ incident in his former workplace. And then the story kicks off when he’s asked to come and solve a problem at the plant. Then comes the action, the suspense, and of course the thrill. You wouldn't want to be anywhere near the swarms – those molecular robots. They're dangerous, they hurt the skin, and they can get into your nasal cavity, suffocating you. They kill wildlife as well as humans. Jack has to stop it, no matter what. Because he designed the program used in modeling the swarms. But he can't do it himself. There are other notable characters there like the quiet, strong and beautiful Mae; devious Ricky; loud-farting/non-stop talking Charley; and of course Jack’s beautiful and secretive wife, Julia. Some of these characters help to achieve the goal, while others stand in Jack’s way. There are lots of deaths in the end. I loved the technological and biological details the author wove in the various part of the story. It’s blended well into the narrative and doesn’t cause any distraction. Even though I found some of them boring or overly done, I still learnt something from them. The five-paged bibliography at the end of the book shows well the thorough research undertaken by the author for this book. 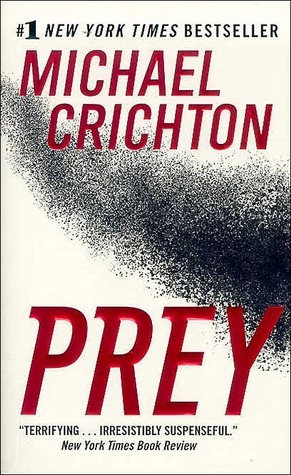 It is a book worth reading, and I’ll certainly read more titles from Crichton. I have my mind on Jurassic Park next. Although I’ve seen the movie, I’d still love to experience the book side of it. I recommend this book to any sci-fi and techno-thriller lover. If you like the science-goes-wrong genre, then this is the book for you. Four stars (****) to Prey. I know people rip on Jurassic Park, but I really liked it. I also loved the first few seasons of ER and he created that show. This sounds like an excellent thriller, but lots of deaths at the end Kaykay? Hmmm, maybe not for me. Great review!! I haven't seen ER; been quite some time since I watched TV. Yeah, Prey is a good thriller, with lots of deaths. I enjoy books with deaths, I don't know why. Thanks, Lucy. I hope you enjoy them. A wonderful review, KayKay. There is something chilling yet fascinating about this book that makes want to read it. Thanks, Uzo. I'm glad you like it. It's a nice book and I'm sure you'll enjoy it when you read it.